We’re really psyched to introduce Eric Glickman-Tondreau, who will be teaching our Intro to Contact Staff class. If you’re looking to “step outside your comfort zone” and stretch your limits, Eric will give you that opportunity—and then some! What is contact staff, and how did you first become interested in learning it? How long have you been practicing? Contact Staff is a form of object manipulation: playing and moving with a prop in a beautiful and skillful way. It’s a fusion of dance, performance, and circus, among other things, and centers around the philosophy of spinning a staff around without holding it in your hands. By experimenting with various properties of the staff like its momentum, axial rotation, the speed of its revolutions, orientation in space, and its position along the body, contact staffers have come up with a repertoire of beautiful and technically impressive movements that can be executed without ever grasping the staff, leading to a beautiful and often improvised flowing dance between the manipulator and the object. Naturally I went, and was introduced to an amazing community of crazy hippies, dancers, acrobats, and everything in between, all playing with these awesome toys and lighting them on fire, right on the Tufts campus. I met a guy named Cookie (because he makes amazing spicy cookies) who coached me through my first burn session, and from there I was hooked. The roar of the fire and the heat and the adrenaline rush captivated me, and I’ve been in love with spinning ever since. I’ve been practicing now for about two and a half years, and now I’ve come to love the discipline of contact staff for its own sake, even without the fire, and I regularly perform with an unlit staff because it allows for much more exploration of the staff’s potential. You just returned from a semester in Spain! Tell us about the fire performance community you found there. Do you have any fun stories to share from your time abroad? Although Spain was amazing, I never found any fire community! I kept hearing about people in Barcelona, but I was living in Madrid, and the most I ever found was a guy juggling on the side of the road outside of the Atocha train station. He told me about a circus school in the big natural park called Casa de Campo, on the west side of Madrid, but I could never find it. I also didn’t bring my staves with me to Spain, so I made up for the lack of practice by taking a physical theater class that taught me all about bringing emotion and imagery into my body movements, which will be incredibly helpful for future fire performances. I’m actually really happy to be back Stateside now, because I can finally get back to spinning again! There’s actually a pretty great story from that class: our mid-semester performance was a Zombie March on Halloween, in Alcalá de Henares, the city where Cervantes lived and wrote Don Quijote! 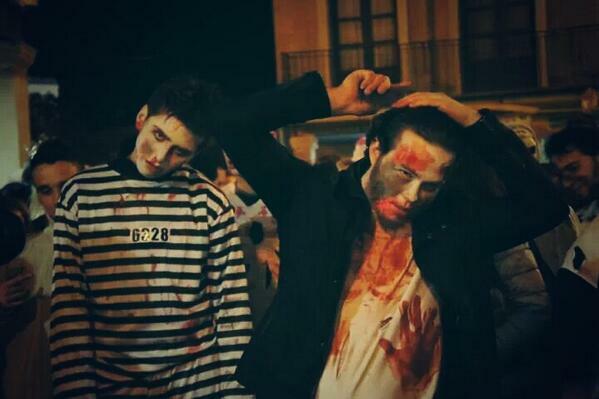 We taught a whole crowd of people the movements, and then we all got made up like zombies and paraded down the Calle Mayor, scaring people and dancing to the traditional University band, or tuna, which got zombified and played music for us! That was an awesome time. What can Skillshare participants expect to take away from your class? Is there a recommended fitness level? Participants should expect to leave the class knowing some of the basic moves of contact staff, and (hopefully) the basics to an intermediate move. The class requires no prerequisites, and is open to pretty much all ages. Height is the key factor, because a shorter person or child will feel more comfortable with a shorter staff. However, we will be working with spinning sticks made out of metal and wood, and mistakes can happen, resulting in the bumps and bruises that come with swinging hard things around. That said, this is not an intensive sports or martial arts class, so risk is present, but minimal. Students should be aware and focused while learning and practicing, and that will avoid 99% of accidents. In addition, there is a vast repertoire of beginner moves, so if a student doesn’t feel comfortable with what I’m teaching the rest of the class, I can show them something that is better suited for them. Don’t let the physicality of the art scare you off, it’s actually a fantastic way to get moving and get to know your body. If Skillshare attendees fall in love with this technique just as you did, are there classes or private lessons locally available? If you see something cool, ask about it! If someone asks you about something you’re doing, show them! Because of this, it’s incredibly easy to start learning whatever you want, and we never ask for money unless it’s a pre-scheduled class by a professional spinner, or a spinning convention retreat. Like the Somerville Skillshare, the spinner community believes in free access to our knowledge, and we work hard to strike a balance between supporting the professionals in our ranks and keeping the community open. Here are the two active Spinjams I know of in the greater Boston area. I am regularly at the Medford Spinjam, and I try to get out to the Boston Spinjam as often as I can. Boston Spinjam: Mondays from 6:00pm-8:00pm. Generally a larger crowd than Medford, but no fire. In addition, I’m helping to organize a large two-day workshop in conjunction with the Medford Spinjam. It’s called WOMBAT (Winter Object Manipulation Bootcamp at Tufts) and it’s not in winter. There will be classes for all levels, and some amazing performances, and I would encourage everyone who takes my class and enjoys it to come! 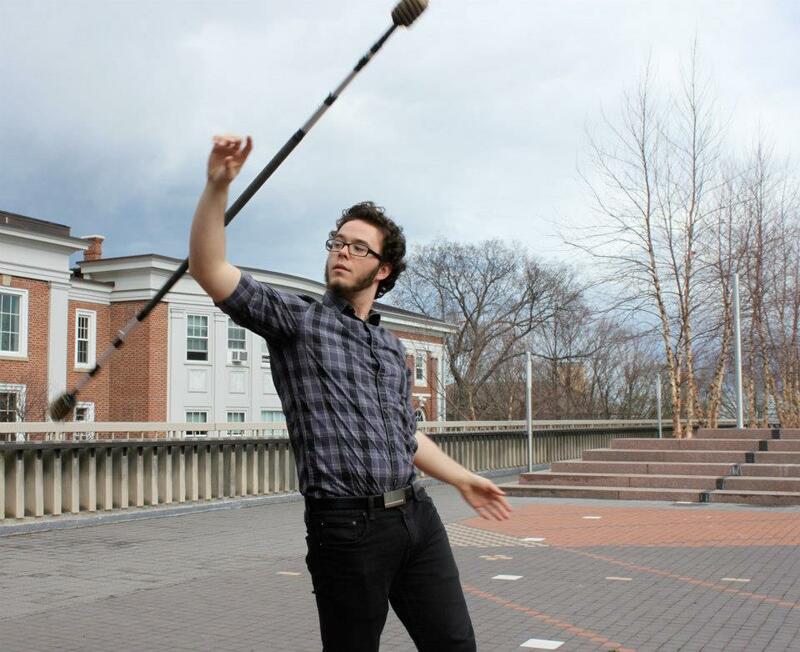 In the spring of 2013, the alternative percussion group BEATS (Banging Everything At Tufts) approached my club (the Jumbo Jugglers and Medford Spinjam) about filming us for the multi-media portion of their spring show “4/20” show on April 20th. Because of the serendipitous nature of their performance date, they wanted something really weird, and we were happy to oblige. The footage came out great, and as a thank you the BEATS cinematographer Jack LeMay cut together this promo for us. The people in the horse and unicorn masks are BEATS members who were dancing with us during the filming. And no, the actual video didn’t make much more sense. If you have any questions about Eric’s class, feel free to contact him by email at eric DOT tondreau AT tufts DOT edu. You can also follow him on Twitter at @EIG_T.